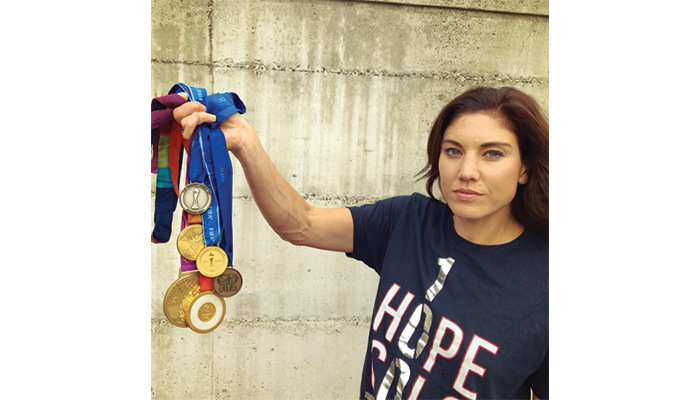 According to Grant Wahl’s Twitter account and his full story in Sports Illustrated, U.S. Soccer has not only suspended U.S. goalie Hope Solo for her Olympic comments about the Swedish team, they have also canceled her national team contract. The six month suspension was for “conduct that is counter to the organization’s principles” following her calling the Swedish team “cowards” for their defensive tactics after the Swedes beat the U.S. team in what’s been described as a “stunning” 4-3 loss in penalty kicks at the quarterfinal Olympic match. Wahl says USWNT coach Jill Ellis and U.S. Soccer general secretary Dan Flynn went to Seattle to give Solo the suspension news in person. She received three-months severance pay. Solo can continue to play for her club team, the Seattle Reign during the suspension, says Wahl who goes on to say that this suspension isn’t just for Olympic comments – it’s for an accumulation of things over time. Solo’s comments were openly criticized by Alex Morgan and Megan Rapinoe of her Olympic team as well as by U.S. Soccer president Sunil Gulati although Solo refused to apologize for them. For the rebuttals from Solo and Rich Nichols, the U.S. women’s national team player representative, as well as additional background information on Solo’s career, go to the SI link above.